Though originally from Wisconsin, Debra Dieppa settled in west Michigan at an early age. 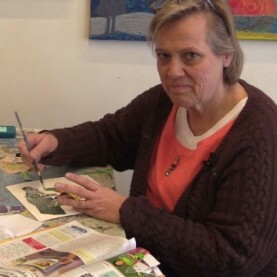 Her first exposure to art came in 1999 when she was introduced to Heartside Gallery, a community art studio located in downtown Grand Rapids. Since then Dieppa has blossomed as an artist and is entirely self-taught. Over the years she has participated in numerous art shows and has been selected for juried art competitions for the past six years. Art has become a powerful way to transform some of the difficult experiences of her life through the exploration of mystery, pain, and beauty. 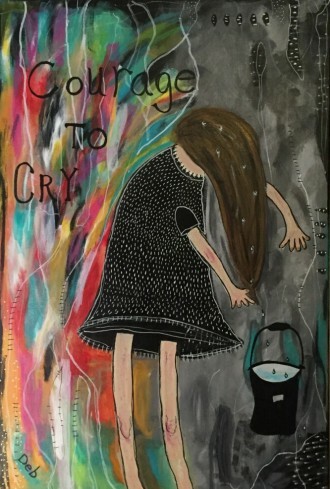 Dieppa is drawn to working with acrylics and oil pastels, and she primarily draws inspiration from her own feelings and emotions. Sometimes her art reflects a deep, inner place, and sometimes she focuses on subject matter that is more idealist and hopeful. Either way her artwork comes from her soul. Dieppa looks forward to continuing to explore her artistic style with new art forms and one day she dreams of attending an art school. For information about Debra Dieppa’s work, including exhibitions and pricing, please contact her. Dieppa was a featured artist at the first annual DisArt Festival in Grand Rapids, Michigan.